Whilst on a recent visit to south-west England on holiday we had a stop-over for a couple of nights at Wells in Somerset near to Glastonbury. 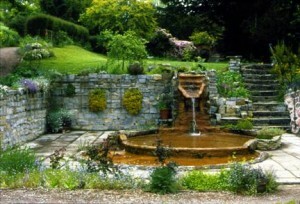 I had read and been told about the Challice Well in Glastonbury, beautiful gardens with a well spring said to be of healing waters, a peaceful sanctuary and place to soothe the soul and revive the spirits. I love gardens. I love to meditate and find peace in beautiful places, so it was with an open heart and delightful anticipation that I stepped into the Challice Well gardens. The path follows a gentle upward slope and the central theme is the stream of water running through the middle. The well at the top of the gardens is described as ‘a much loved holy well …. known as the Red or Blood Spring.’ One legend suggests the water represents the blood of Christ. A beautiful garden it is. The landscaping, planting and way the water has been engineered to flow I found to be inspirational. But why couldn’t I find that sense of ‘inner peace’. I immersed myself in the moment and became aware of a number of distractions and observations – one that it was fairly busy, almost crowded. As I walked up to the well-head I was acutely aware that there was only one place to sit near the back of the space and that the four or five people sitting around seemed to be in a deep contemplative state. Respecting their silence I couldn’t excuse myself as I almost tripped over their toes in getting to the only available seat and being very English I found myself feeling uncomfortable. I really couldn’t get into a peaceful frame of mind. Helicopters flew noisily overhead, motorbikes accelerated up the adjacent road and, although requested not to use mobile phones, someone was speaking loudly on one not far away. I soon noticed I wasn’t the only person looking ill at ease. Three women sat by the well. The one in the middle seemed deep in thought. The ones either side took turns to fidget and shift about, clearly not wanting to disturb the middle woman but maybe wondering when they should make a move. It would have been easy to admonish myself. Here I was in this world famous spiritual place of peace and meditation, yet I just couldn’t get it. What was wrong with me? Instead it started me thinking about what it is that makes a place one of peace and contemplation. Perhaps it is different for all of us. For me I appreciate quiet, nature, and above all perhaps solitude, the ability at least to go deep within myself without feeling self-conscious about the needs of others. I can find that state when gazing at works of art – but normally only when I can go at my own pace and in my own time. I find that state also when holding my sleeping grandchild. It can be there whilst gardening or cooking or sitting sewing and it can be there even on a car journey. It is more difficult for me to find that state of peace when I have been told that this is what I should feel. In the story of the emperor’s new clothes the people went along with the crowd in agreeing that the emperor’s clothes were beautiful. It took a child to point out that he was really naked having been duped by the tailors into believing that the ‘fabric’ of his clothes could only be seen by the wise. Do these thoughts suggest I’m a bit of a cynic? I hope not because finding that sense of peace and at Oneness is the greatest joy in life. I do think though that we need to accept that we won’t all be moved by the same piece of music, work of art or place of contemplation or worship. Maybe we need to be honest with ourselves about this and find our own ways to the Soul.